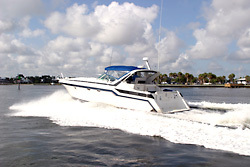 To prepare men and women to operate and maintain their vessels for safe, efficient, and pleasurable voyaging. To provide a foundation for Students with limited "sea time" for entry into a maritime industry career. To qualify for admission, the student must be 18 years of age or older, in overall good health, and must be able to use mathematical skills and the English language in order to fully benefit from the program. Students undertaking the Mariner Training Program who progress to a satisfactory standard may elect to upgrade and transition to the full Professional Mariner Training Program. For students wishing to upgrade to the Professional Mariner Training Program an additional tuition cost of $840.00 will apply. To register for class please complete the Mariner Training and Port Canaveral Registration forms below and submit by email to info@chapman.org or via fax to (772) 283-2019. The Chapman School Registration Form and the Port Canaveral Registration Form must be completed and signed (by a parent or guardian if the applicant is younger than 18) and returned to the Chapman School along with the $150 non-refundable Registration Fee. Tuition deposit is due 45 days prior to the start of class. If the registration is not accepted by the School, all payments made will be refunded promptly. If cancellation is requested within three (3) business days after signing the Registration Form, all payments made by the applicant will be refunded in accordance with the Buyer’s Right to Cancel. If cancellation is requested more than three (3) business days after signing the Registration Form, but before the beginning of classroom instruction, the applicant is obligated for the non-refundable $150 Registration Fee, which may be transferred to a future class date within one year. Once classes begin, if the student wishes to withdraw within the first two weeks of the program, he/she is obligated to pay the equivalent of two (2) weeks tuition. Thereafter, the student is obligated for the full tuition. Applicable refunds are returned within 30 days. Campus housing consists of dormitory apartments. Each apartment contains a bedroom, convertible living room/bedroom, bath, kitchenette and covered porch. All apartments are air conditioned, fully furnished and equipped with refrigerator, counter top range and cooking utensils. Housing fee includes utilities. The maximum number of students per apartment is three. Single housing, if available, is at a premium rate. Campus housing must be booked in advance to ensure availability. Sorry, no pets. The School is not responsible for the loss of any personal property. Security deposit is due with the Registration Form to reserve accommodations. Student Housing fees are due 45 days prior to the start of class. If a student cannot attend the class in which registered, housing fees & deposits are refundable. Once a student moves into the facilities, no fees will be refunded except the $300 security deposit, and that within 30 days after inspection of the vacated room. In the event any student does damage to the accommodations, he or she will be responsible for the replacement cost & labor required to repair the damaged School property. In the event the damage exceeds $300, the student will be responsible for the additional costs of repair. Please note that 2 days of the program will be conducted in Port Canaveral, FL. Students must make their own housing arrangements for this period. A student must attend at least 254 hours (89%) of the first 285 hour portion of the program. For the final 40 hours of the program, 100% attendance is required. These requirements are sttrictly adhered whether the absence is excused or unexcused. Classes meet daily, Monday through Friday from 8:30 am to 4:30 pm for the first 285 hours of the program then 8:00 am to 5:00 pm for the final 40 hours of the program covering STCW Basic Training. More than fourteen (14) hours or two (2) full class days of any unexcused absences in any (3) three week period is considered excessive and may result in dismissal from the School. Any student who takes extensive leave beyond allowed attendance policy limits due to any special circumstances such as prolonged illness, family emergency, etc., will be permitted to re-enter the program at the phase of training that is identical to the one he/she left. Earlier phases of training may be repeated at no additional cost as determined by the School. If a student has been terminated for attendance reasons and can provide evidence to assure that the cause of poor attendance has been eliminated, the student may be re-admitted on a probationary basis for a three (3) week period. Seven hours or one full class day of any unexcused absence during this time will cause termination. Students are required to observe proper standards of personal conduct. Justification for dismissal from the School would include any action that interferes with the ability of fellow students to study, the overall safety of the campus facilities or the smooth running of Chapman School. Proper dress, including shoes, shirt and pants or shorts must be worn in the classroom and the Administration Building. 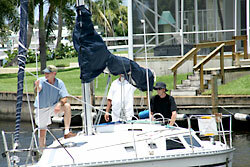 Work clothes are recommended for shop and boat maintenance lab work. To safe guard against infection from minor scrapes or punctures, we suggest obtaining a current tetanus booster. Examinations will be scheduled throughout the program at the end of each course. 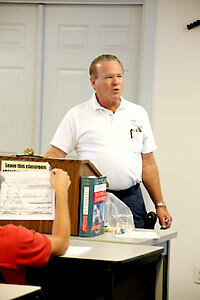 Instructors may average quizzes or other grades with the examination to determine each grade. The grades that are turned in to the office may be reviewed by the student upon request. The final course grade will be based on the average of all course grades. Each course grade will be weighted based on the number of hours in each course. To qualify for graduation, the final average must be 70%. or higher. All student records will be kept on file for the viewing by the student and authorized parties. A standard system of weighted percentages is used for recording student progress. To remain in good standing, a student must maintain an average of 70% or better. If the grades on record at any time period appear to place a student in academic jeopardy, a progress report will be issued and a student/administration conference will be held. The student will be given a period of time during which he/she must pass course work that will bring the average up to satisfactory. If grades are not brought up to passing, the student may be terminated for unsatisfactory progress. Re-entry will be at the discretion of the School’s administration. 2. 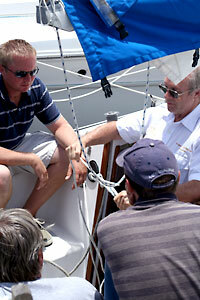 Sea Time for all boat handling components of the program. Sea Time will be accredited as deck department sea service associated with bridge watch keeping duties under the supervision of the Master or qualified officer. Requirements for Graduation - The Chapman School awards a certificate indicating satisfactory completion of Mariner Training. All attendance requirements must be met and any financial obligations to the School satisfied. A final average of 70% or higher is required.